There are currently three spark plug thread diameter and pitch sizes used on motorcycles and ATVs: 10 mm x 1.0, 12 mm x 1.25 and 14 mm x 1.25. There are currently two thread reaches (lengths) used: 1/2 inch and 3/4 inch. Never use a spark plug of the wrong reach. 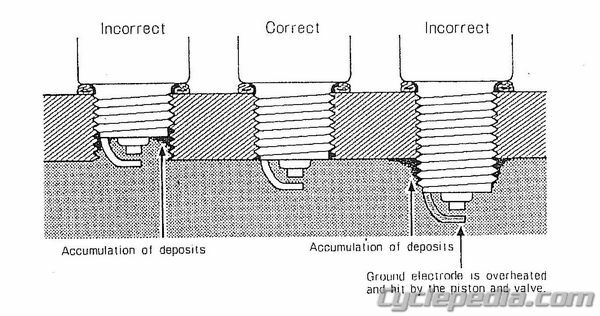 If the reach is too short, carbon deposits can build up on the threads of the spark plug hole, plus the spark will not properly ignite the air/fuel mixture. If the reach is too long, the piston could contact the spark plug, plus carbon deposits can build up on the spark plug threads. There are currently three spark plug wrench sizes used on motorcycles and ATVs, 5/8 “, 18 mm and 13/16”.